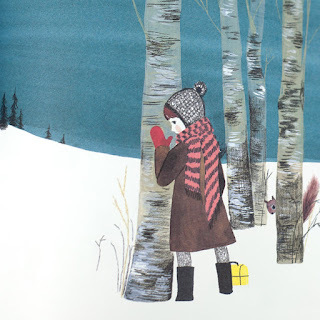 This picture book is quite old now but it's the first time I've laid eyes on it, and I am completely charmed by it. The aesthetic is very Scandinavian, those birch trees, so much snow, the isolation. The nameless girl narrates her own story of when she was six and started school. She has to walk from her home to the bus stop to catch the school bus, through the woods, over hills and hollows. It is dark when she leavesShe is a little nervous but continues onwards, and makes herself less afraid by singing until the sky lightens and the bus arrives. This might seem mind-boggling to a Kiwi child, certainly a city child who would never be allowed to walk such a distance in daylight, never mind in the dark. 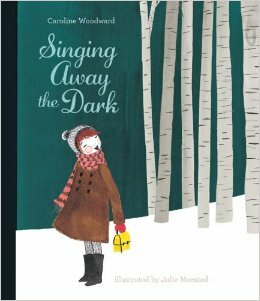 This will make our singing girl all the braver in the eyes of the reader, just imagining what it might be like to be in such a place, alone. 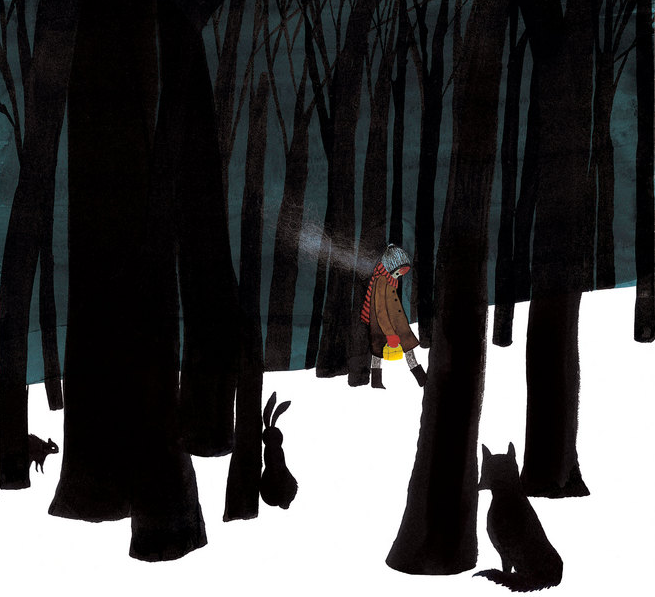 The text is carefully paced and rhymes beautifully; the lines are spread out over pages, the rhythm and rhyme sneaking up on you as you walk through the woods with our girl. The pages are laid out with lots of white space, just look at that cover, split into white and green, the trees balanced by the girl with her yellow lunch pail like a lantern in her hand. The song she sings is to the army of trees she walks by "I see a line of big, old trees, marching up the hill. I salute you, Silent Soldiers. Help me if you will." Drowning out the sounds of the "creaks and groan and hoots and howls" of the woods. As she gets closer to school the pages lighten until she' is in the cloakroom with other girls and she seems much more like an ordinary little girl, not the incredibly brave six-year-old making her way through the wilds. 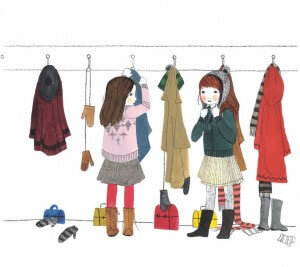 I'm reminded of Extra Yarn by Mac Barnett and Jon Klassen, with its similar setting and also the heroic young female character, it's fine lines with careful use of colour too. It's whimsical but also inspiring - shouldn't our children be able to discover their heroic selves by learning to face up to danger... to experience solitude... and discover the power of a song at just the right moment.